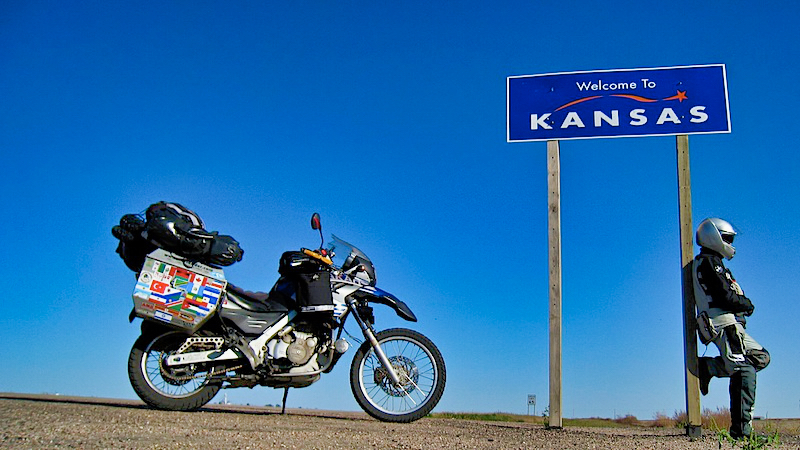 You are here: Home / North America / USA / Crossing Kansas – Birds, Wheat, Sunflowers & A Toilet Seat. 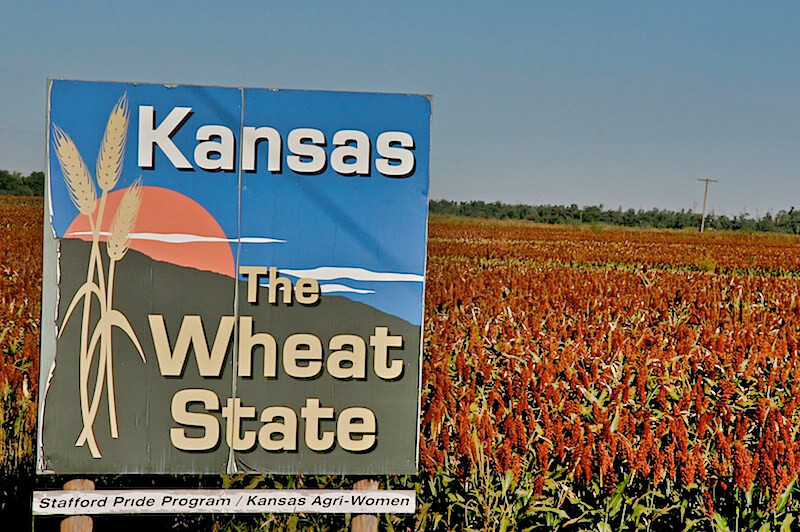 Crossing Kansas – Birds, Wheat, Sunflowers & A Toilet Seat. Perhaps ever since Judy Garland, in her most memorable role, confided in her dog, Toto, her revelation that she was no longer in Kansas, the state has been the brunt of many jokes. Most, I’m sure, in good taste. Yet those off-color likely often mouthed by people who either whipped through the state across the straight and boring interstate or otherwise have never ventured through the heart of this often misunderstood state. On the surface the state seems a tad starved. There is no National Park and those bits of its past that made it into the history books include the landmark Supreme Court case Brown v. Board of Education – a plaque in Topeka commemorates perhaps the first major step in ending racial segregation in the South. Kansas also earns the star as the first state to consitutionally prohibit alcohol – in 1891. And though to its chagrin, Kansas graced the front pages of the nations newspapers with the brutal murder of a family – the murder, family and murderers brought to life in Truman Capote’s classic “In Cold Blood.” And all of this collectively feeds the mainstream subliminally suggesting a less than a paradise mindset about Kansas. 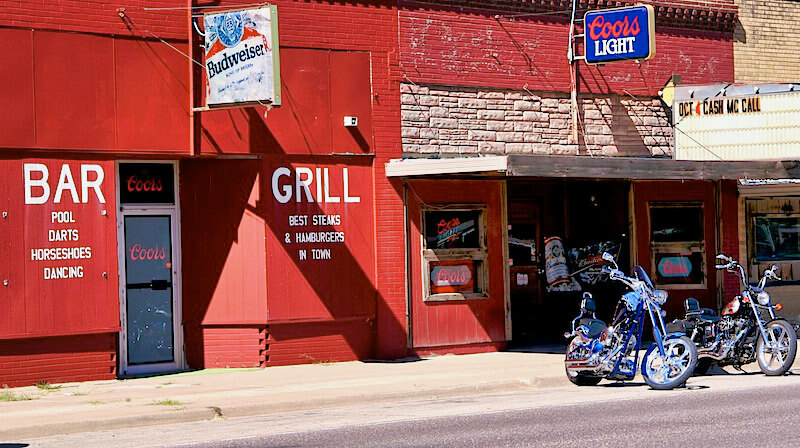 I found Americana in Parsons and as I noted the old town Wichita charmed me – if only for an evening. So, far from the interstate I wondered through the plains and the prairie hoping to get to understand Kansas, before crossing the border into Colorado. 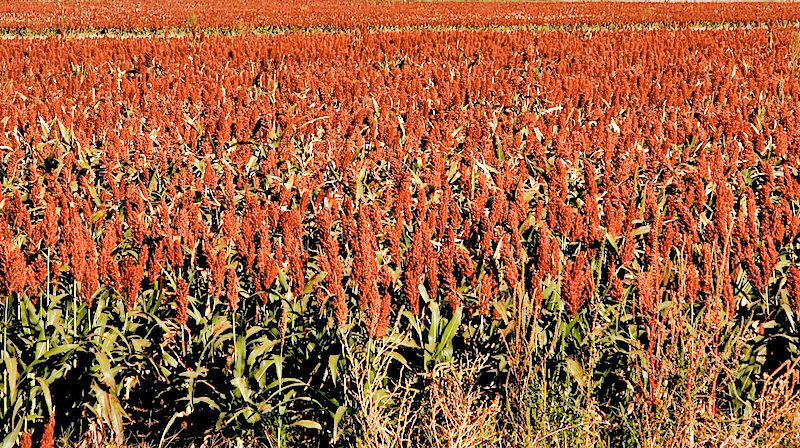 Getting to know you – Kansas. 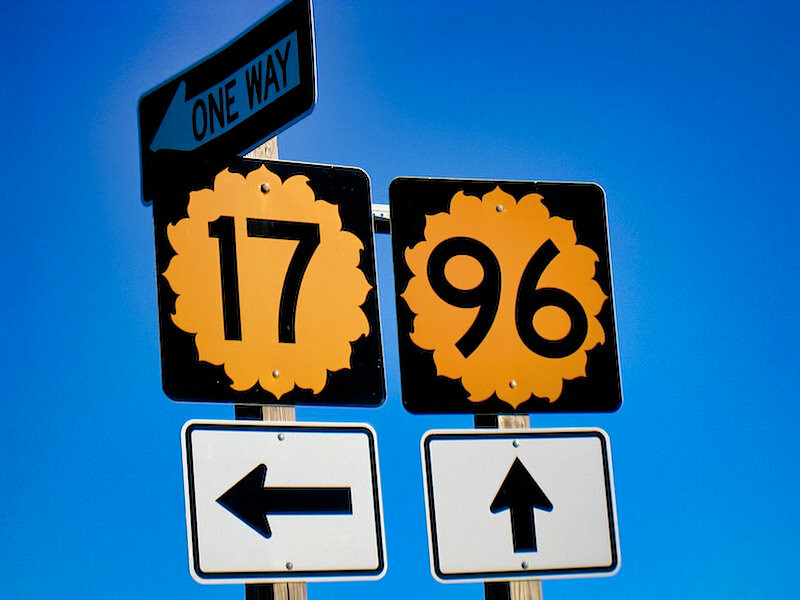 Charm and fun in only the backroads across America. What’s this? A horse and buggy? Yes! An Amish community in the middle of nowhere. Yoder Kansas. I found it here. In Kansas. The needle in the haystack. 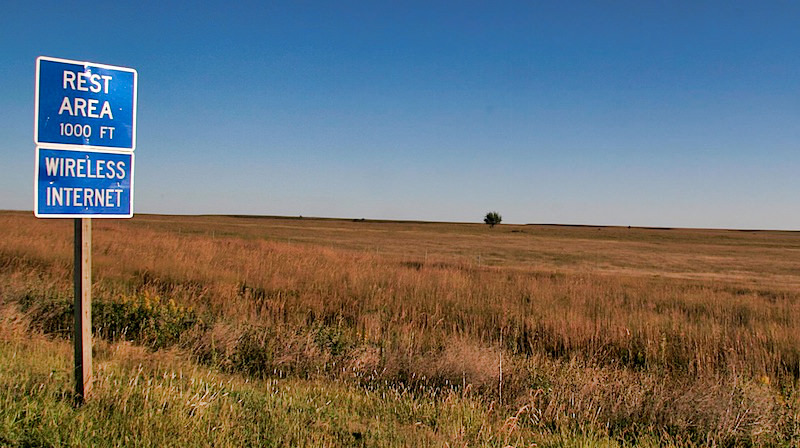 There are two National Scenic Byways in Kansas and when I found myself a scant shy of the Wetlands & Wildlife National Scenic Byway, I took a slight detour to see if riding this bocky loop through the prairie and grasslands might give me a peak inside a Kansas most of us don’t see. Riding through miles and miles of straight roads that often end in a T-junction and like an old etch-a-sketch zig-zag at right angles through fields of wheat, soy and sunflowers. Then through Quivira National Wildlife Refuge. 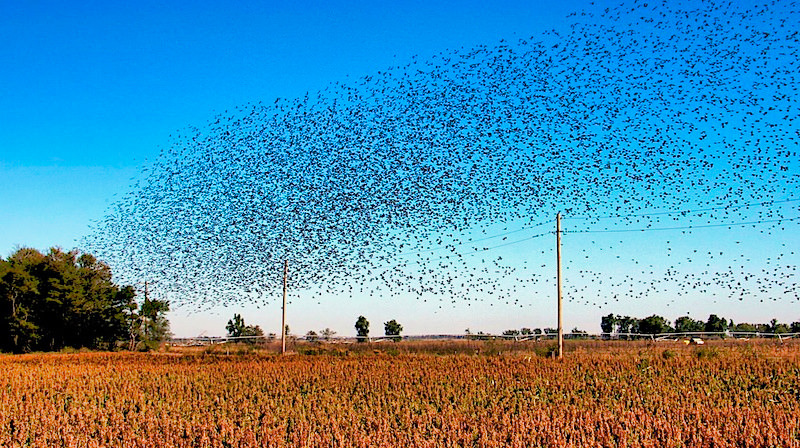 Soon, I found myself mesmerized by the chaotic yet unison rhymic move of black birds across the road. Through the field. They don’t move far. But like horses out of the gate, these birds moved on some mysterious cue. And then they’d sit. Silent. Still. Until the next cue. My exhaust pipe continues to increase in volume and a new rattle from bolts loosened inside. In sore need of repacking, I turn off the engine to watch the birds. When I start it up, the birds move. I find that a subtle and simple twist of the throttle gives this unique power to command those birds to move – in unison. For a second. Then they land on the crop in time. I do it again. And they move. 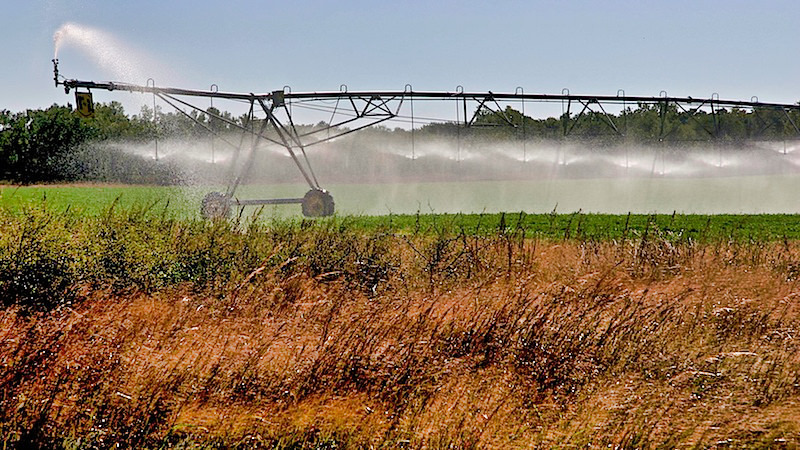 It’s then I rewind my brain to Argentina and to the place my friends there refer to as “el campo.” Loosely translated as the farm, I think it means the plains the prairie. For the same golden brown glow of the crops and the bright yellow sunflowers burning through an otherwise landscape lacking contrast. As the orange and yellow orb of the sun set in the west, the fields of brown, yellow and ochre colored fields based and came alive. A thing of beauty in a place most see nothing — especially after traveling through hundreds of miles of this along the interstate. What’s this? Not wheat? Maybe soy? The wild wicked ways of birds – flying on whim and unison anyway the wind blows. 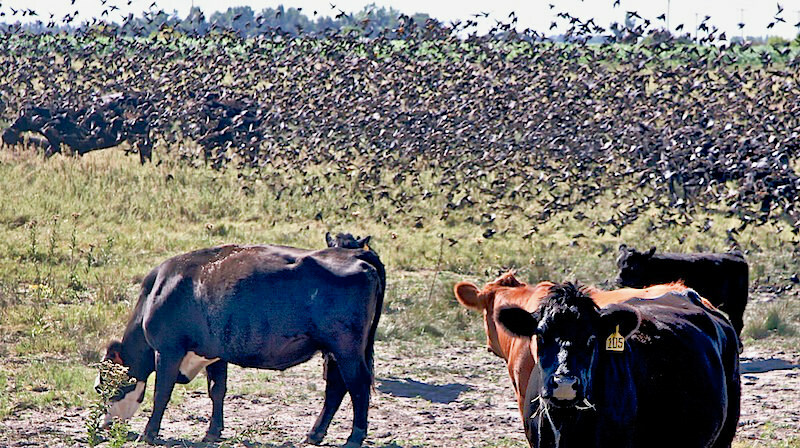 Birds so dense you can’t see the cattle behind. Straight and narrow. 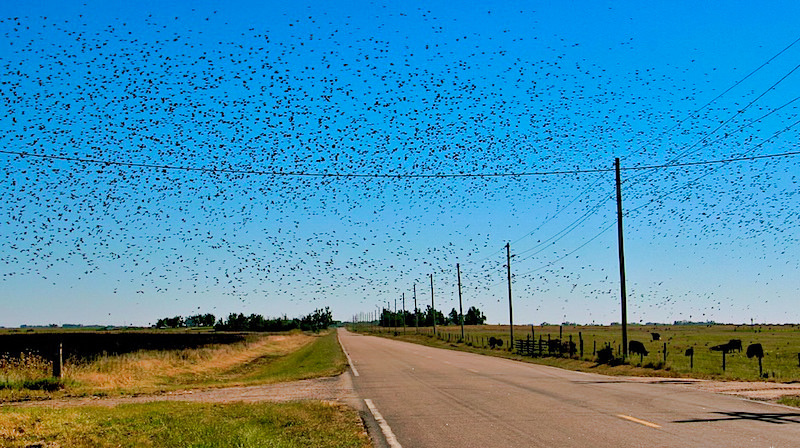 The roads and birds of Kansas. I’m riding down a long lonely stretch when I see coming toward me a carriage. It looks like a carriage. As I get closer it’s a horse and buggy. I think back of an old client who constantly accused and congratulated me for taking his company out of the horse and buggy age and into the present. 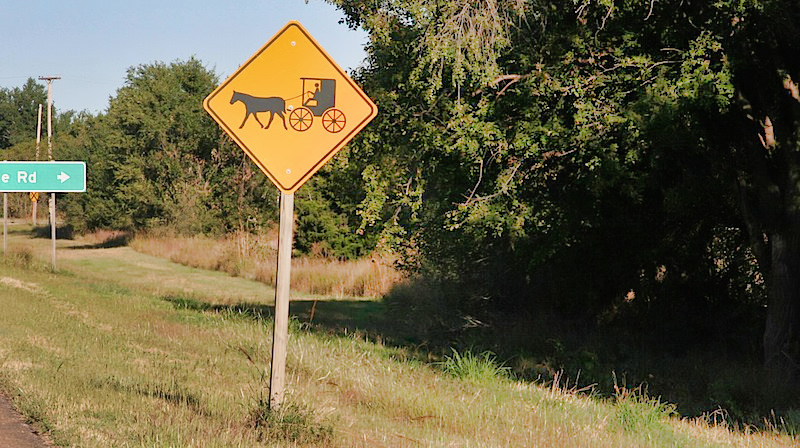 It’s Yoder Kansas, And I had no idea, but there’s a large Amish community here – far from Pennsylvania. Famous for its quilts, Yoder registers on the map of Quilt enthusiasts worldwide. Paradise of Quilts, I’m told. I see several buggy’s and exchange waves with a man wearing a tall hat, cuddled up against a dog in the front seat. The gas stations have no credit card slots and the pumps no auto shut off. You pump first. And pay later. 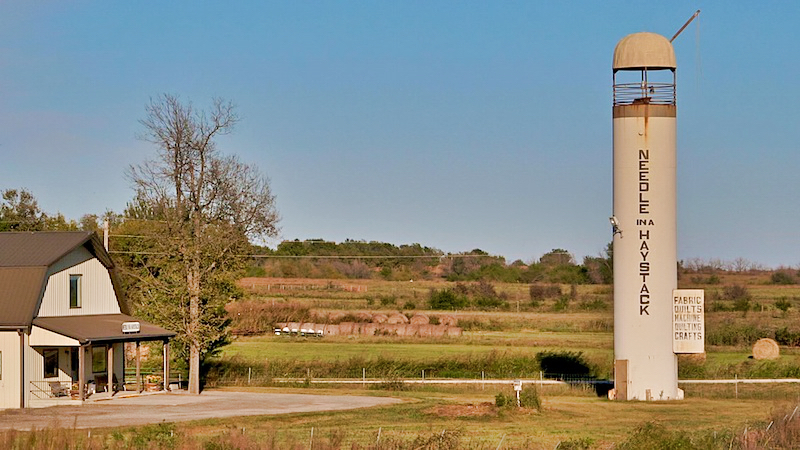 In Kansas I pumped but my mind wandered as the gas poured out of the tank and flowed onto my boot. There’s no questions. I’m not from around ‘these’ parts. It’s the Wheat state. And after exploring the wacky route of this byway, I found myselt in a state other than Kansas. Hungry, parched and sleepy. I pull into a small market in Ness City, Kansas. A local schoolteacher leans his bicycle against the window and sits next to me with his microwaved hot dog. 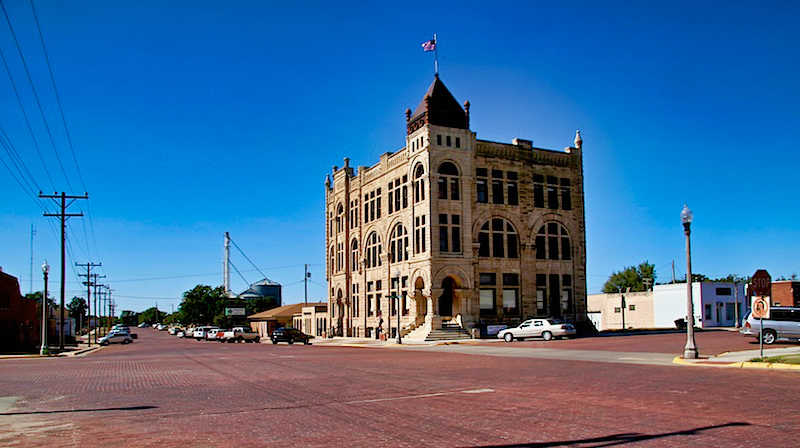 Tells me I need to see the Skyscraper of the Plains – a four-story building built in 1890 that once housed the Ness County Bank. 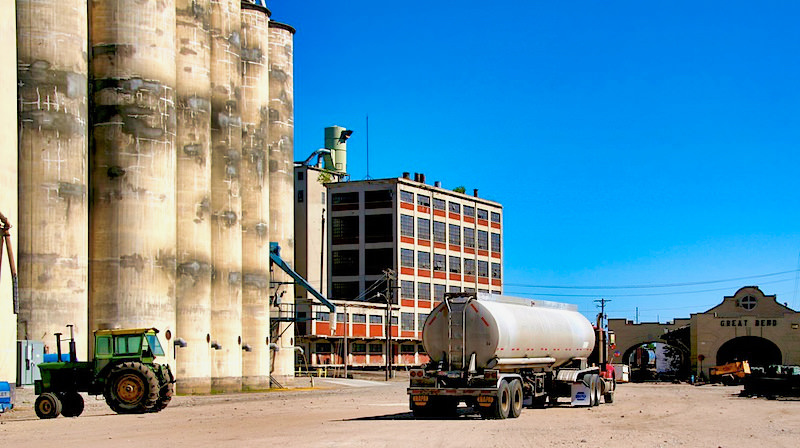 Today it’s one of the 8 Wonders of Kansas and hoses a few boutiques on the ground floor. Tours are available a couple days each week, but not today. 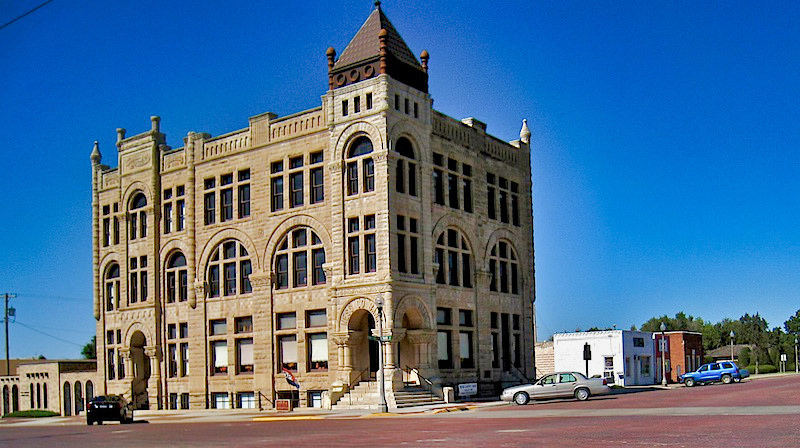 Ness County Bank – the former – Skyscraper of the Plains. Ness City, Kansas. I may be in Kansas still and on some off the beaten track. Yet I find one tree. And a lonely rest area with wireless internet. This is progress. https://i1.wp.com/www.worldrider.com/wp-content/uploads/2014/08/IMG_0747_2-tm1.jpg?fit=300%2C200 200 300 allan https://www.worldrider.com/wp-content/uploads/2014/08/worldrider_logo_white_border-trans1.png allan2008-10-04 15:11:232008-10-04 15:11:23Crossing Kansas - Birds, Wheat, Sunflowers & A Toilet Seat.